where two cowboys from the Comanche Pool, Comanche County, Kansas, are buried. They were killed by Indians, almost certainly in the 'incident' known as Dull Knife's Raid. ON SEPTEMBER 12, 1878, THE BODIES OF REUBEN BRISTOW AND FRED CLARK WERE FOUND NEAR HERE. IT WAS BELIEVED THAT THEY HAD BEEN KILLED BY NORTHERN CHEYENNE LED BY CHIEF DULL KNIFE. BRISTOW AND CLARK WERE COWBOYS HAULING SALT FOR COMANCHE POOL CATTLE WHEN DULL KNIFE FLED HARSH CONDITIONS ON THE RESERVATION NEAR CANTON. 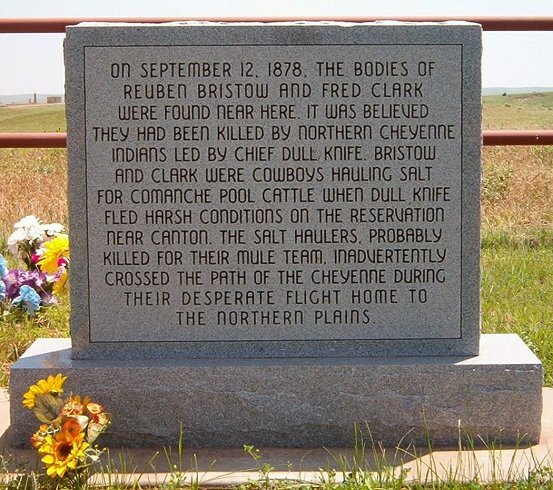 THE SALT HAULERS, PROBABLY KILLED FOR THEIR MULE TEAM, INADVERTENTLY CROSSED THE PATH OF THE CHEYENNE DURING THEIR DESPERATE FLIGHT TO THE NORTHERN PLAINS. At left: The front of the original gravestone in the Cowboy Cemetery, Woods County, Oklahoma. Photo by Bobbi Huck. A story by Wendel Ferrin of how & where early Comanche County residents got salt for their cattle. REMINISCENCES OF CHARLES F. COLCORD Address Delivered - "Pioneer Reunion" Medicine Lodge, Kansas, February 9, 1934 -- Chronicles of Oklahoma, Volume 12, No. 1, March, 1934. This RootsWeb website is being created by HTML Guy Jerry Ferrin with the able assistance of many Contributors. Your comments, suggestions and contributions of historical information and photographs to this site are welcome. Please sign the Guest Book. This page was last updated 24 June 2005.